Defender Ash Taylor is confident that Tranmere Rovers will do enough to ensure their League One survival in the final four matches of the season. 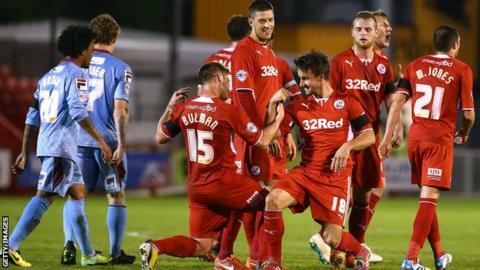 Rovers lost 2-0 at Crawley on Tuesday, with Matt Tubbs and Gwion Edwards ending hopes of a third straight win. Tranmere remain two places and three points above the relegation zone. "If we'd have got the three points it would have helped us a lot, but it's still in our hands and we're still out of it," said centre-back Taylor. More than 250 Rovers fans made the 500-mile round trip to Crawley and many will undertake a similar length of journey on Friday when John McMahon's side visit Gillingham. Speaking to BBC Radio Merseyside, the 23-year-old continued: "You've just got to prepare right and get your rest in because the travelling is long. "We're playing for everyone at the club and the fans have been fantastic, travelling all this way on a Tuesday night, and they'll be there again on Friday at Gillingham."